What a weekend! 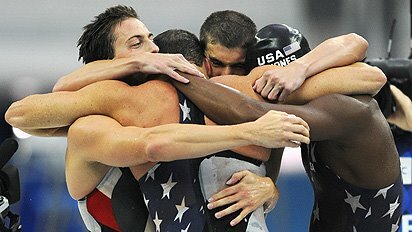 Saturday night, we watched as Michael Phelps claimed his first gold medal in the men’s 400 IM. It was the event he said would be his toughest. Well, he blew past his own world record by 2 seconds and made it look easy. Then, last night Jason Lezak pulled of the comeback of all comebacks to bring the men victory in the 4X100 freestyle relay. It was unbelievable. Coming out of the final turn, he was still nearly a full body-length behind the Frenchman Alain Bernard. Suddenly, it just seemed like something changed inside of Lezak. Barnard hadn’t slowed down. If anything, he was exploding during the last 50 meters. Lezak just wanted it a little more, and his determination paid off when he touched the wall first. In comparison to the feats of athletics I saw this weekend, my accomplishments were rather small. In my own way, I had some good success. 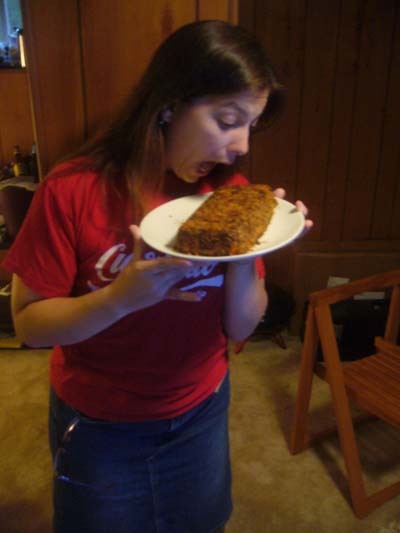 Here’s another vegan loaf recipe that’s a bit more “meaty” tasting. 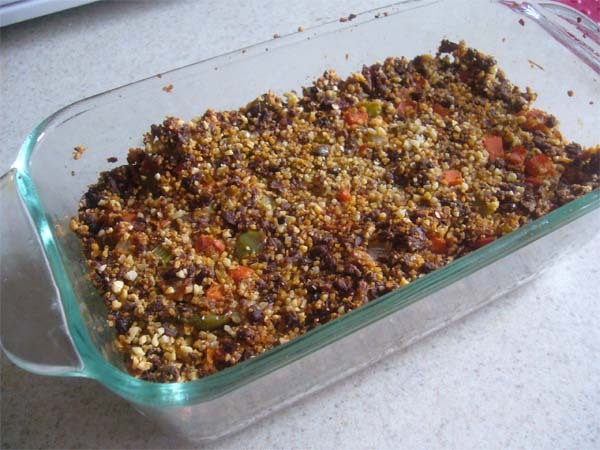 Use the same method as the lentil-veggie loaf and add only as much vegetable broth as is needed to bring the loaf together. This loaf only takes about 40 minutes to cook, although you can leave it in the oven for 5 extra minutes if you want the top to be very crispy. Divided into 8 slices, it comes out to about 116 calories and 10 grams of protein per slice. It is low in fat and carbohydrates too, but I don’t have the numbers with me right now. I’ll post them in the comments later if anyone shows interest. In other news, I decided on a chocolate protein powder to experiment with. It’s by BSN and it’s called Lean Dessert (in chocolate fudge pudding flavor). It made really good ice cream—yum! I really like it, but I’m still trying out more samples because as powders go, it comes in a little bit low at 20g protein per scoop. I got a sample of Jay Robb’s whey powder at Vitamin Shoppe. That comes in at 25g protein per scoop and they only use milk from cows that have not been given hormones. To me that seems like a good thing. I have enough hormones of my own, thanks. Also, looks like it’s back to the drawing board on the iron front. Remember that I mentioned I was due for blood work in August? Well, everything came back looking great with the exception of my ferritin (1), iron (9), iron saturation (2), and hematocrit (25%). It’s really hard not to get discouraged. Pushing more red meat into my diet doesn’t exactly thrill me because of the cholesterol factor, so fixing this issue will be about making good choices and creating new ways to sneak iron into recipes. Safeway sells giant bags of frozen shrimp and scallops. I can toss those into my stir-fries along with vegetables like broccoli and red peppers that aid in iron absorption. I also plan to buy some bran flakes and molasses to make iron muffins. Another thought that crossed my mind was finding some young, mild calves or chicken livers, chopping them finely, and adding that to one of my protein loaves. Like I said, I’m going to have to get creative. It’ll probably mean giving up my beloved protein bars as snacks in exchange for something that is high protein AND high iron, like some tuna fish or a molasses-bran muffin. At any rate, I spent most of last evening researching high-iron recipes and I will most certainly post anything successful. Even though I’m discouraged about my iron level, I have to remember that I’ve successfully raised my vitamin D and B vitamins, have normal liver functions, and have maintained proper levels of everything else. My goal now is to keep eating healthy and to raise my hematocrit as much as I can. I’ve said it before, but I truly believe writing down a goal is all the motivation we need sometimes, and this situation is no exception. I will fine tune my eating habits to focus on protein and high iron. Since I’m not a medical expert, I’ve also consulted a hematologist to help me monitor everything. I hope everyone is having a wonderful start to their week and that the sun is shining wherever you are. Stay motivated and stay positive!